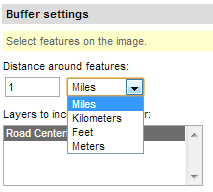 The buffer distance around your selected features can be modified by entering a number into the input and then selecting the units for the buffer distance. The layers to include in the buffer are the layers in your current map selection that you want to buffer around. Control-left click on multiple layers in the box in order to include them in the buffer selection. 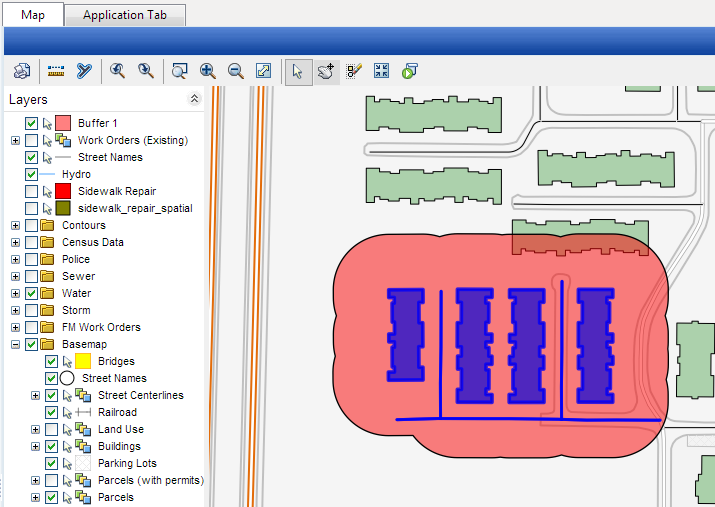 In the example below, only the Street Centerlines layer is selected, so the buffer will ignore Buildings and Parking Lots, even though they are selected on the map. If you've changed your map selection since launching the buffer tool, you can click on the refresh button in order to refresh the layer listings to include in the buffer. Remember to re-select the layers you want included in the buffer. This is the name of the buffer on that will appear in the legend. Enable this checkbox to preserve any previously created buffers. If unchecked, creating a buffer will destroy any existing buffers on the map. You can configure the fill and border style of the buffer by selecting the appropriate values. Click the "Done" button to create the buffer with your current parameters. Note that if you don't have any selected features on the map that are on the selected layers to include in the buffer, no buffer will be created. Otherwise, your buffer should appear on the map and legend. Click the "Cancel" button to cancel creating a buffer entirely.